Welcome to Rappleyea’s Nursery, where quality and service meet. Since 1975 we have been professionally serving New Jersey and the surrounding areas. Centrally located in Allentown, New Jersey, we are withing a 15 mile radius of Mercer, Middlesex, Monmouth and Ocean Counties. WIth over 300 acres in production, we are a major grower of plant material in New Jersey, including but not limited to the current growth of over 60,000 shade trees, 60,000 evergreens, and 100,000 container plants, with many more planned in the future. Our large inventory eliminates availability issues, insuring timely completion of your projects. We approach the 2017 year with a more expanded product line and believe we have a wonderful opportunity to supply the best product to our customer, along with great pricing. We continue our tradition to make the names of Rappleyea’s Nursery products synonymous with the highest grade nursery stock that professional skill, patience, research and careful training can produce. To our many satisfied customers, we value your business and welcome the opportunity to serve you again this year. ​Should you require immediate assistance or information, please contact Rappleyea's Nursery directly at (609) 298-2450. ​We specialize in Shade Trees, Evergreens, and Deer Resistant Plant Material. Call today - 609.354.2450 - and one our of Nursery experts will be glad to assist you. Rappleyea's Nursery provided trees for the "Floating Island to Travel Around Manhattan Island." This project, developed by Robert Smithson and produced by Minetta Brook, in collaboration with the Whitney Museum of American Art, features a barged ladscape intended to be a "non-site" of Cental Park. 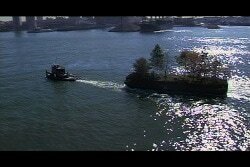 In September of 2005 this fabricated island was towed around the island of Manhattan by a tugboat. To read more, click HERE.